Get ready to be amazed with this project idea from Ashley Cannon Newell! "Guess what? Now, there’s a way to add texture to paper crafting projects! Leather is a great material to use for a variety of products, including craft projects. However, leather is expensive, can be difficult to work with, and may not be socially acceptable. 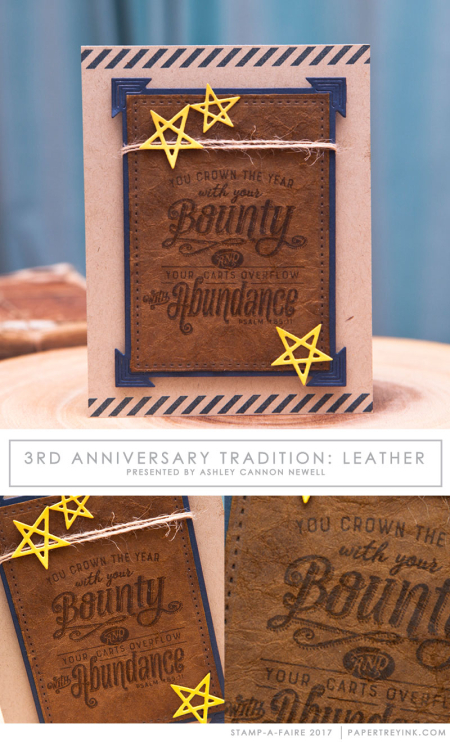 This tutorial provides a faux leather option that may be incorporated into an assortment of paper crafting projects, including cards. Leather-like elements will make creating masculine projects a breeze, and add amazing texture to many other project styles." In a spray bottle, mix about 2/3 water and 1/3 pure glycerine and shake. Spray the water-glycerine mixture over both sides of brown cardstock. Crumple the wet cardstock into a ball a few times. Flatten the cardstock and repeat steps 2 and 3. Let the cardstock dry, preferably overnight. Die cut, trim, or stamp like cardstock. Handle with care and use liquid adhesive to adhere it to other paper. Now it's your turn! Create a project featuring faux leather. You can choose to re-create the exact project from Ashley above or design your own using the same concepts. Your project must also incorporate at least one Papertrey product. I love the results that Ashley got here! It is so authentic! Are you excited to give this a try yourself? Can't you see this being a great addition to masculine cards? I know it is something I will be using a lot myself! We look forward to seeing your projects! Ashley’s video is awesome! Unique tutorial! Very cool technique Ashley! Love it! That is so cool…haven’t seen this done before and can’t wait to give it a whirl! Very cool and I love the look Ashley. A great go to for masculine cards for sure, Thanks!! That is a great technique!! Love the look of leather! Thanks Ashley! What a great look! Perfect for masculine cards! Can this be done without using glycerin? Can’t wait to try to his technique. Masculine cards are always SO hard for me–and now I have something new to try! Great technique. Yes..perfect for the dreaded masculine cards. Cheers. Wow I am amazed! The paper totally looks like leather. I’m excited to give this a try! Wow! I can’t wait to try this! This is a great technique! I’m glad I went ahead and watched even though I’m behind. I can get some ready and drying while I play catch up! I love this, Ashley! I’ve never seen this technique done with glycerine before, and had no idea it helped give the cardstock elasticity. Looking forward to creating many, MANY masculine (and even feminine) cards with this technique! Best video so far for Stamp-a-faire! I did this years ago with paper bags and my preschool kids to make cowboy vests. Don’t know why I never thought of using cardstock and making leather cards. Just made 3 sheets of leather and twiddling my thumbs until they dry. Thanks for the wonderful inspiration! What a cool technique– perfect for masculine cards! This is a great technique perfect for masculine cards. I’ve read about it in the past, but have never tried it and am looking forward to giving it a whirl! I will pick up some glycerine the next time I’m at the drug store, this looks like a fun technique to try. I love this card! It’s a great technique to keep in reserve for the shabby chic look. Thank you so much! What a wonderful video. Thanks for sharing. Wow, how amazing this is! Looking forward to giving this a try. Oh my, this is so realistic looking. Love it. Nice Ashley! I had a stock of leather and leather papers, immediately thought of a leather football or cowboy hat, but needed a thank you for some Packer clothing, so my card developed from there. You never know where creativity will take you! Wow, Ashley! What an ingenious technique and I love that I have a new way to create a masculine card. Thanks so much for sharing! ? Such a unique and fun way to create a leather look. Love the inspiration. Awesome technique! Thanks for sharing! Loving this! I have the back of a journal leathered up and waiting to dry. This looks fun and easy. I can’t wait to try! Mine are drying, now I just need to think of something to do with them!! It is amazing how the glycerin completely changes the texture and appearance of the paper. Thanks for the great technique and video!! This technique looks like a fun one to try! What a very cool look! Great sample card! I have glycerine on hand so I am going to try my hand at this! I think leather tags would be a lot of fun like you mention in the video. I wish I had a die cut set that included one of those old time scrapbook album shapes, that you used to see in leather because this would be perfect for that too. Wow, this looks amazing! I love how the stitching Die really makes it look like leather. Cool technique. I must try. this is what I have been waiting for! I love learning new techniques and this was great fun to make, and I just finished my card and love the look, thank you Ashley!! I am learning so much with this Stamp-a-Faire! Love the technique and look with the glycerine! Great video and card, Ashley. Thank you! Very crafty! I just love this technique … never seen it before and the results are amazing! Thanks for teaching and inspiring!!! What a handsome card! Love the faux leather look and texture in Ashley’s tutorial! Making this type of leather looks so easy! I think it would change it and make it more feminine to use off white or blush paper and it would still look gorgeous. Great instructional video. Thank you! Ashley, what a great technique! Got to get some glycerine into my life. My drug store list: glycerine, cotton balls, Lays BBQ potato chips…wait how did that get on there?! What a fun technique! I’ll have to try this when I get some glycerin. Thanks for sharing with us! What a fun technique! Very cool. OMG this looks so realistic! Fun and easy! I’m waiting for my faux leather to dry right now, but I think it’s going to make a great card. I hope I don’t forget about this technique. Very cool, Ashley! I’m now waiting for my faux leather to dry so I’ll continue on with other challenges. Enjoyed your video with all the details! Very, very cool. I love this faux leather technique from Ashley! Great for masculine cards. Amazing video! Fabulous masculine creations! Perfect look with the masculine touch! I love how the paper actually feels like leather – flexible and supple! So cool looking! And it seems so easy! Really love this faux leather look. It really looks great with the sentiment. Really great technique and card. I can’t believe how much this looks like leather! I am always on the lookout for masculine card techniques and this an amazing one! What a great technique! This faux leather will be so great for masculine cards! Thanks so much Ashley! This is great for masculine cards, love the leather look! Wow! This looks so real! Another new to me technique, thank you! Always liked your videos and love this idea for masculine cards. Hope to see more of your videos in the future. Ashley, this was my favorite project of the day! Thank you so much for sharing it. I will definitely use this technique again in the future. I had a time finding the glycerine in the store, but it was worth it! I just love the feel of this faux leather. I just wanted to sit & pat it lol! Thanks, Ashley. Great technique. Very cool effects! Thanks for sharing some new techniques. These look fabulous! So realistic! Ashley I loved doing this so much I made two cards! Awesome technique and perfect for masculine, but also for fall and Halloween cards! Fantastic technique and you are right, Ashley – those cards are perfect for masculine cards. Thanks for the awesome tutorial! Your card is fabulous. Love the way this looks! I’ve crumpled paper before but never used glycerine. Now if I can just remember where I have some around the house! Wow, I can’t believe how much this looks like leather. I’m definitely going to have to try this out!! This truly looks like a leather bound book on your card; fabulous! This techique worked great and it really looks like leather. Thanks for the tips. Wonderful card. I love the western feel. Thanks for including the video. This is a gorgeous technique!!! No glycerin to try it but on the wish list now!! Wow!!! This is so cool!! It actually looks like leather. I’m definitely going to be trying this!! Fabulous card!! Thanks so much for sharing! This technique is great and yes, a wonderful fit for masculine cards. I need to get some glycerine. Hope to try this in the future. Thanks so much for sharing this awesome video & technique. I love the leather look! Your faux leather technique is awesome. Great inspiration. Great idea for paper! Off to try it now. This was so much fun! I love the feel of the paper. I can’t wait to try this some more in other colors. Stamping in the same color as the paper also gives it that embossed leather look even. I think these leather looking techniques are my favorite. Amazing card!! Love this!! Great way to make a masculine card!! The faux leather is such a great look–especially for masculine cards. Never thought about doing faux leather… It looks amazing! Another perfect technique for masculine cards. Great technique! I am looking forward to trying this. I always struggle with masculine cards!! Great technique & project. Going to buy some glycerin tonight so I can try this. This is such a cool technique, Ashley! I’m amazed at how leathery that actually looks! I will have to try it! Wow, the technique looks easy-peasy! I’m itching to try it out, thank you Ashley! This technique is so easy and you get great results. Mine came out looking like suede. I’m going to try this with feminine colors too like pink and grey. Thanks for the video and inspiration! Wow, this really looks like leather! What a fabulous idea for cards for teen boys! Beautiful card, love the leather look especially for masculine cards. I have not done this technique in years! I love how it looks so much like real leather. Great card! Really does look like leather! Another technique that can be added to the masculine cards file. Thank you, Ashley. I’m so impressed with how much the end result looks like leather! I made tags as you suggested in the video! What an awesome way to make faux leather! It looks so real! Amazing cool technique and super video. One of my favourite this year. This will be good for my Texas-themed cards. I can’t believe how that looks like leather! Amazing! And I love the card so much. I’ve had glycerine sitting around for ages to try making paper leather and you finally got me to use it! LOVE the look and how easy it was! I also love this idea of using the traditional anniversaries for PTI’s 10th! Such a great idea, I’ll be doing this again!! This is so cool! I will eventually try this. 2017 SAF was THE event of all crafting events! I loved that there were 3 days of fun crafty activity! I managed to complete 14 of the 21 challenges. SO MUCH FUN!! Ashley, your leather technique was my favorite of the weekend. It’s so addicting! Thank you PTI for putting on such an amazing event!! I have crumpled cardstock to add texture but haven’t tried this technique of spraying the water-glycerine mixture to it. Can’t wait to try it. Such realistic results! Love faux leather….so masculine and easy to create!